eD@HoMe: 3 Lovely covers from France! 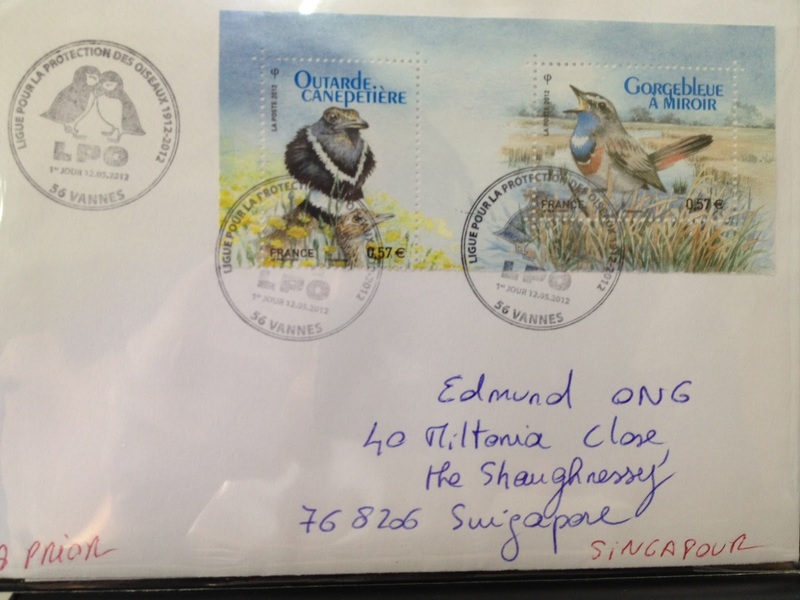 3 Lovely covers from France! 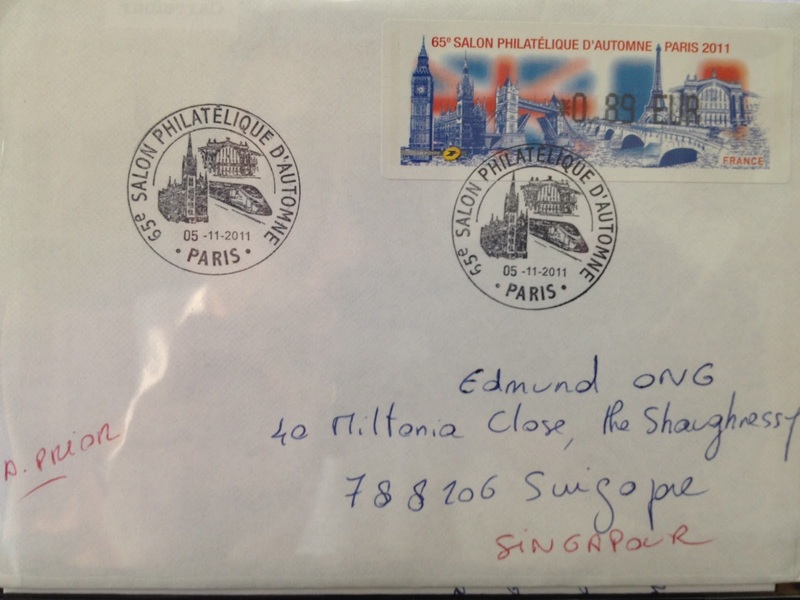 Many thanks to Francois Leboucher for these lovely covers posted from France! Merci!! Every year, during the first half of November, the Chambre syndicale française des Négociants et Experts en Philatélie (CNEP) organizes the largest annual philatelic event in France, the Salon Philatélique d'Automne. The 65th Salon d'Automne held on 3rd - 6th Nov 2011 brought together more than 80 stands of philatelic dealers and specialist press, 11 European postal administrations (Belgium, Bulgaria, Germany, Italy, Luxembourg, Monaco, San Marino, Switzerland, Ukraine, United Nations and Vatican), plus the United Kingdom as the guest of honour, as well as the Overseas departments and territories of France (Mayotte, New Caledonia, Polynesia, Saint-Pierre et Miquelon, TAAF, and Wallis and Futuna). 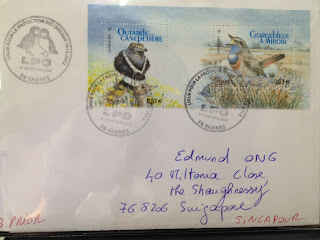 Phil@poste released two special vignettes d'affranchissement for the Salon d'Automne 2011. 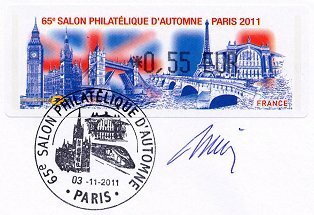 Both issues are dedicated to the UK, as the guest of honour in 2011, 40 years after it was the first guest of honour at the Salon in 1971. The first design (affixed above) shows some of the most important monuments of London and Paris. On the left, London is represented by the Big Ben, St Pancras Station and Tower Bridge. On the right, Paris with the Pont Neuf, the Tour Eiffel and the Gare du Nord. 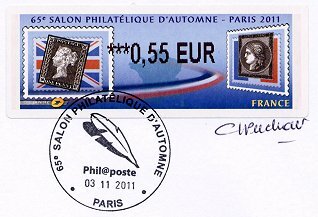 The second design, also dedicated to the UK, shows the UK 1840 Penny Black - the first stamp issued in the world and the first French stamp - the 1849 Cérès, respectively. 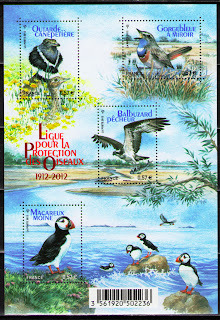 The next cover shows 2 lovely stamps from a Miniature sheet entitled "Endangered Birds of France". 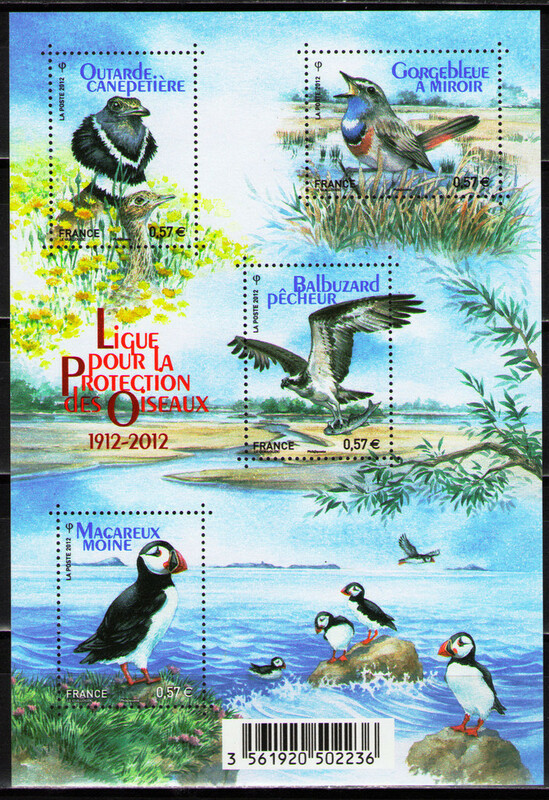 Issued on 14 May 2012, this MS commemorates the centenary of the League for the Protection of Birds (LPO). 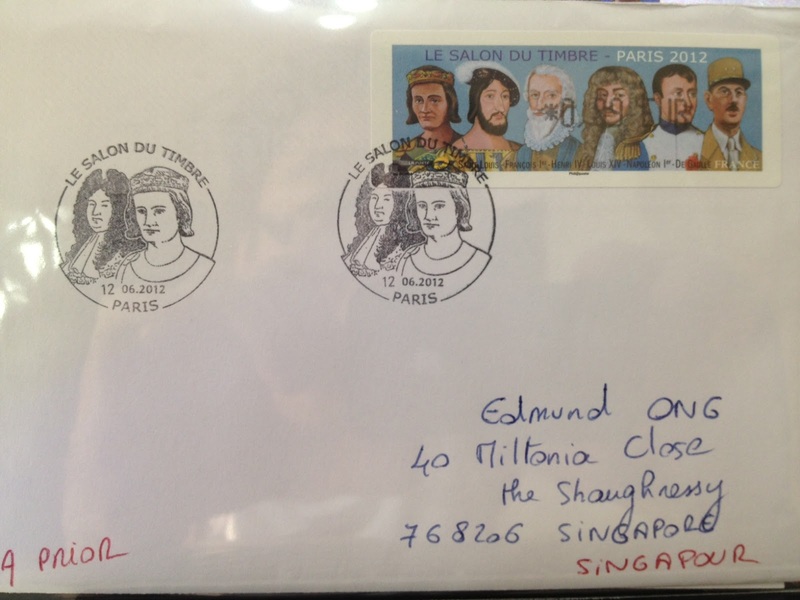 Last but not least, the third cover was posted from 5th Salon du Timbre or Planète Timbres. The ATM stamp is one of 3 designs dedicated to the event. 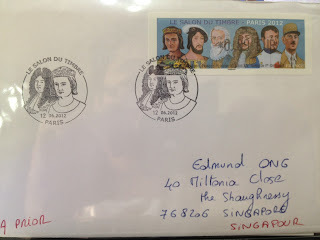 This ATM stamp depicts some of the major French rulers between the thirteenth and twentieth centuries - Kings Saint-Louis (or Louis IX de France), François 1er, Henri IV, Louis XIV, the emperor Napoléon 1er, and general Charles De Gaulle. The other 2 designs were dedicated to the Franco-American friendship and 85th congress of the FFAP respectively. My First Cover From Honduras!! A Nice Surprise from Sri Lanka! My First Cover from Monaco!! Traditional Greek Dances Cover & Postcard!